Baia Mare ([ˈbaja ˈmare]; Hungarian: Nagybánya; German: Frauenbach; Ukrainian: Бая-Маре; Latin: Rivulus Dominarum; Yiddish: באניע‎, Banya) is a municipality along the Săsar River, in northwestern Romania; it is the capital of Maramureș County. The city is situated about 600 kilometres (373 miles) from Bucharest, 70 km (43 mi) from the border with Hungary, and 50 km (31 mi) from the border with Ukraine. Located south of Igniș and Gutâi Mountains, Baia Mare had a population of 123,738 at the 2011 census, and a metropolitan area home to 215,932 residents. The city administers four villages: Blidari (Kőbánya), Firiza (Felsőfernezely), Valea Borcutului (Borpatak) and Valea Neagră (Feketepatak). The city's development on the middle course of Săsar River, in the middle of a plateau with a warm Mediterranean-like climate, has facilitated living conditions since the Palaeolithic. During the Bronze Age the region was inhabited by Thracian tribes. Later, it was included in the Dacian Kingdom formed by the King Burebista when the mining exploration began, as the area is rich in gold and silver. Baia Mare is first mentioned in written documents released by Charles I of Hungary in 1328 under the name of Rivulus Dominarum (English: Ladies' River). In 1347 the town was identified in documents by Louis I of Hungary as an important medieval town with a prosperous mining industry. Its rules of organisation were characteristic of the "free towns" of that time. In 1411 the town and its surrounding areas, including the mines, were transferred into the property of the Hunyadi family by Sigismund, King of Hungary (later also Holy Roman Emperor), who recognised Janos Hunyadi's contribution to stop the Turkish invasion of Europe. The town entered into a period of prosperity, during which the St. Stephen Cathedral was built. Today the cathedral tower is one of the best-known of the town's historic landmarks (see Stephen's Tower). The first school, named Schola Rivulina, was opened in Baia Mare in 1547 by the Reformed Church following the Protestant Reformation. In 1703 Pintea Viteazul and his band managed to free the town for a short period of time from the German Imperial rule, under which it belonged the royal treasury. Since then Pintea is considered an important figure in the town's history, representing the idea of freedom. The Budești Church has Pintea's chain mail shirt and a helmet, reportedly worn by him in his battles. The Museum of Baia Mare displays his weapons and their harness. In 1748 the city's mining industry made a leap forward when the Austrian authorities created the headquarters of "Superior Mining". In the late nineteenth century, Simon Hollósy, István Réti, János Thorma, Béla Iványi-Grünwald and Károly Ferenczy were among numerous young Hungarians who left the area to study the arts in Munich, as Hungary lacked an academy of art in those times. Simon Hollósy, the young Hungarian painter, was teaching in his studio new western European techniques. Some of those young painters decided to settle down together in Baia Mare, then called Nagybánya, to work on art. 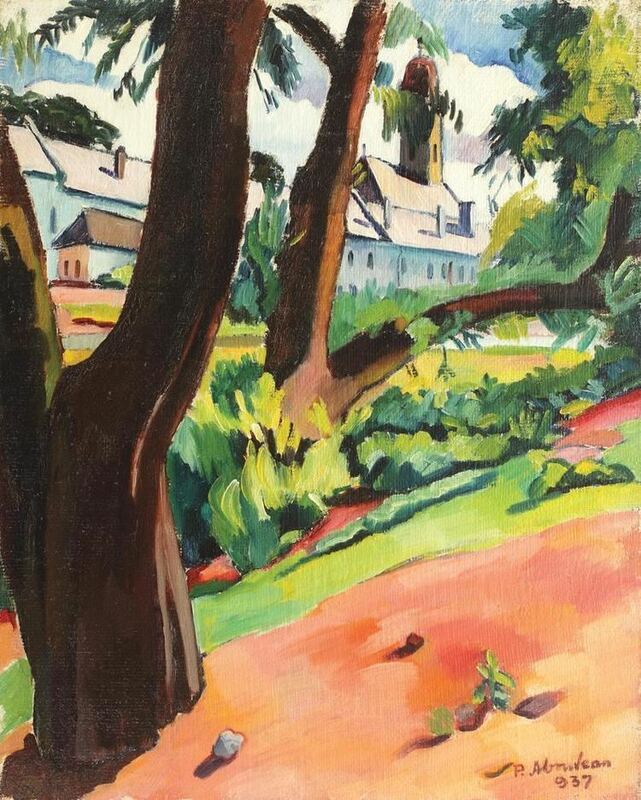 They persuaded Hollósy to join them and founded the Nagybánya Artists Colony, working on naturalism and plein air painting. The artists' colony became known later on for influencing the development of twentieth-century Hungarian and Romanian art. Works by each of these important painters is held by the Hungarian National Gallery in Budapest, which in 2009 opened the exhibit, Munich in Hungarian, Hungarian Artists in Munich 1850-1914, 2 Oct 2009 - Jan 2010. In addition, in 1966 the museum held a major exhibition of their work: The Art of Nagybánya. Centennial Exhibition in Celebration of the Artists' Colony in Nagybánya. Following World War I, the Austro-Hungarian Empire was dissolved, and in 1919, Baia Mare became part of the Kingdom of Romania. It was re-occupied by Hungary between 1940-1944 under the Second Vienna Award between Hungary and Germany, during World War II. Near the end of that period, the city hosted the Baia Mare ghetto. After the war, the city was returned to Romania. Shortly after World War II in postwar development, the town of Baia Mare started to grow both in population and inhabited area. In the late 1970s and early 1980s, a new town centre was developed with modern architecture buildings and structures. In 2000, Baia Mare was the site of what has been considered Europe's worst ecological disaster since Chernobyl, which took place at gold mining company Aurul, a joint-venture of the Australian company Esmeralda Exploration and the Romanian government. The tailing dam at the gold processing plant broke and 100,000 cubic metres (3,531,467 cubic feet) 70 tons of toxic cyanide and heavy metal-laced waste water escaped into the River Tisza and into Hungary, making its way into the Danube and affecting Romania, Hungary, Ukraine, Serbia, and Bulgaria. More than 1,400 tons of fish, numerous eagles, storks and otters died. Scientists fear the release may have led to the ultimate extinction of at least five fish species. Despite the accident's happening in Romania, much of the adverse effects were suffered in Hungary. The accident prompted Hungary to ban the use of cyanide in gold processing and it has urged the rest of Europe to do the same. The coat of arms of Baia Mare was granted to the city by the Government in the late 1990s, early 2000s, some years after the communist symbols established in 1968 where de facto out of use starting 1989. The shield is party per pale. In dexter, gules a miner in a mine argent, in sinister, azure a church tower or. The shield is topped by a mural crown with seven towers. The miner refers to the main local economical activity. The church tower refers to the local cultural/ecclesiastical tradition. The crest shows the city's status as a county seat. The city is situated in the vicinity of the Gutâi and Igniș Mountains. Altitudes reach 1400 meters in some peaks. The area is famous for its outstanding landscapes, and the mountains are easily accessible from the city, famous routes being: Igniș (1307 m), Mogoșa (1246 m), Gutâi (1443 m), Creasta Cocosului (1450 m), Piatra Soimului (839 m), Plestioara (803 m), Dealul Bulat (683 m), Murgau (633 m), Dealul Crucii (500 m) etc. Some of these mountains provide skiing slopes, most notably the one at Mogoșa, which is the most difficult slope in Northern Romania. The city is situated in the Baia Mare valley and is encircled on all sides by hills and mountains, which makes the climate in the city milder than the rest of the surrounding area. Proof of this is that the outskirts of Baia Mare are the only areas where you can find chestnut trees that usually need Mediterranean climate to grow. This is the northernmost reach of the chestnut tree. However, abrupt temperature changes take place and, during the winters, the temperatures may occasionally drop below -20 degrees Celsius. The summers are mild, cooler than in the rest of the country. The precipitations in this area are quite high, due to the mountains in the north and east which do not allow the air masses to pass beyond the region's limits, the average rainfall being almost 1000 mm/year. The city of Baia Mare is the most populous of Northern Romanian cities (Satu Mare, Suceava and Botoșani), with a population of approximately 149,735. It also has a high level of culture and education, being home to theatres, schools, museums and art galleries. Not far from the city there are a few very important natural reservations, among them Creasta Cocoșului, Cheile Tătărului, Lacul Albastru etc. Because of its privileged location in the Eastern Carpathian mountains it is considered one of the most picturesque cities in Romania. and 642 others, including Greeks, Turks, Italians, Lippovans, Poles and Slovaks. 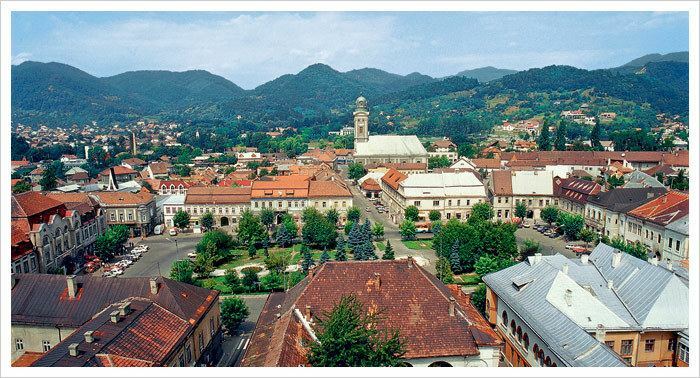 Baia Mare metropolitan area has a population of 215,932, an area of 1,395.38 square kilometres (538.76 sq mi), and includes the municipality of Baia Mare, five towns (Baia Sprie, Cavnic, Seini, Șomcuta Mare and Tăuții-Măgherăuș), and 13 communes (Cernești, Cicârlău, Coaș, Coltău, Copalnic-Mănăștur, Dumbrăvița, Groși, Mireșu Mare, Recea, Remetea Chioarului, Satulung, Săcălășeni and Valea Chioarului). In 1912, out of the total population of 12,877 people, 9,992 were Hungarians (including Jews), 2,677 Romanians, and 175 Germans. 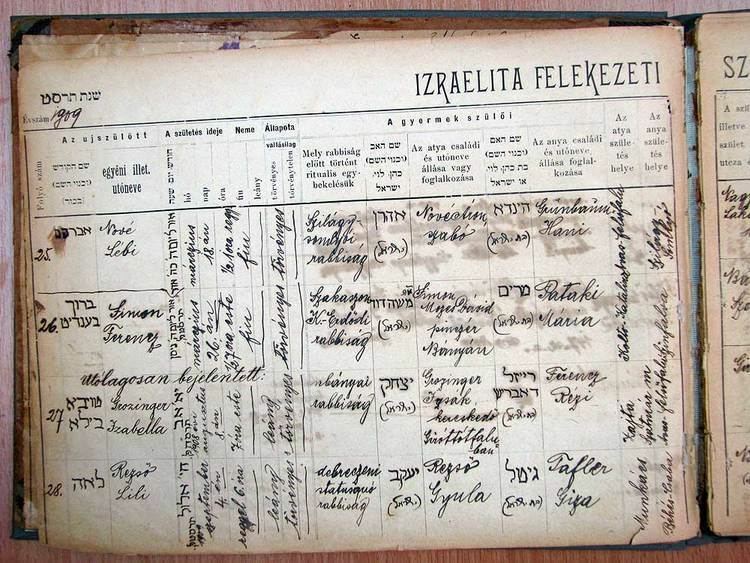 Before the Second World War, Baia Mare had a community of more than 1,000 Jews. In 1944, most of the Jews were deported by the Hungarian occupation authorities to Nazi concentration and extermination camps. Most of the few survivors emigrated from the area. As of 2011, 32 Jews lived in the city. Along with Rădăuți, Gura Humorului and others, Baia Mare had a Jewish shtetl, or settlement. The synagogue dates from 1885. The Baia Mare Municipal Council, elected in the 2012 local government elections. The economic activity of Baia Mare has been based on the mining activities located in the surrounding areas. However, after the 1989 Revolution and industrial changes, such mining declined considerably. They have been replaced with several activities which have improved the city's economy in recent years. Baia Mare has become one of the most economically evolved cities in the region. As a result, several supermarkets have been built in the city as well as one of the biggest shopping malls in over 100 km (62 mi) radius. The largest sofa manufacturing plant in Eastern Europe, Italsofa, is located near the Baia Mare city highway ring. The road infrastructure within the city is changing to be able to better connect the city and absorb the traffic. An express road is to be built between Petea (at the border with Hungary) and Baia Mare, a project for which the feasibility study has just completed. The express road will connect the cities of Baia Mare and Satu Mare to the Hungarian motorway M3, and thus to the whole European motorway network. The city has a mainline (and branch) passenger and freight railway service provided by CFR, the national railway carrier. In Baia Mare there is one library( with a few branches), 6 museums, one planetarium and observatory, 2 theaters, 2 cultural centers, one art school and one popular university. Chimney of Phoenix Copper Smelter, height: 351.5 metres, which is the tallest structure in Romania.